I sometimes wonder about the people who write history; to what extent are they getting it right? When one has lived through an event and then finds it recorded differently from the way it is remembered, one has to ask the question: which is correct, my memory or this account? An example happened to me today. I was thinking about the post for this morning and, for some unknown reason, Avon's brief foray into the world of F1 tire supply came to mind. It occurred to me that few F1 enthusiasts would remember that the little British tire manufacturer once had a go at the big time, so I decided to write about it. My memory told me that Avon entered the game some time in the early eighties and added the information that they stepped in when one of the big tire companies left in a huff (I think it was Goodyear, annoyed that Michelin were supplying just a couple of teams while they had to keep all the others happy). This would have left most of the teams without tires except for the fact that Avon offered to make up the gap. Or so my memory reckoned. Obviously, that was a bit sparse to build an article on so I resorted to Google to see what others had to say. And it turns out to be one of the hardest subjects to find solid information on; even Avon is very quiet on the matter in its history of the company. 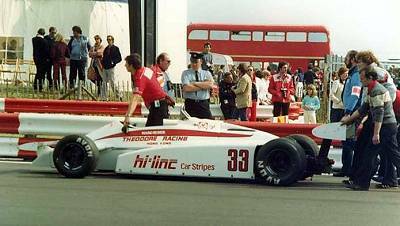 Eventually I did find a page or two that admitted that Avon had supplied F1 tires in 1981 and 1982 but there was nothing about their bold attempt to fill a gap left by another supplier. It does seem that my memory may be at fault for, as well as Goodyear and Michelin, Pirelli were involved at about the same time. Be that as it may, I do recall that the teams were not happy with the Avon tires - understandably since Avon were entirely new to F1 and could hardly be expected to immediately supply a tire as advanced as more experienced manufacturers. When the chance came to get tires from another source, teams deserted en masse and poor Avon found themselves without a reason to be in the game anymore. They left, probably saving themselves from bankruptcy at the same time (it's an expensive business developing and supplying F1 tires). But from where do I get this idea that Avon became involved as a stop-gap measure for a departed supplier? Am I confusing the company with Pirelli, since they too were having a go at the time? Or am I correct and the company is so embarrassed by their adventure that they have expunged all mention of it from the history books? If anyone knows the answers to these questions, I would be very grateful to hear from them. It is odd that Avon would be secretive about its F1 past, since it does have a decent record in it (three fifth places is better than many teams manage, let alone tyre companies!) Having looked at the statistics on ChicaneF1.com, Connaught, Fittipaldi, Tyrrell, Tyrrell, ATS, Ensign, Theodore and March all used Avon tyres. What all these teams seem to have in common is that Michelin supplied them for the first 10 races (i.e. up to and including Britain), and then Avon supplied them for the other five (i.e. from the German GP onwards - thank you grandprix.com). This strongly implies that Michelin decided not to supply those teams after Britain. Michelin has a history of quitting F1 at relatively low levels of provocation - they left in 1983 due to costs, left in 2006 because they didn't like the way the FIA was leading F1, and probably left in 1981 due to the political mess. Some other teams, notably Lotus and Arrows, also had to change supplier as a result, but since they opted for Goodyears and Pirellis respectively, they need not detain us any longer. The Avons may have been fairly slow, but they did at least work. In the very first Avon race, Eddie Cheever's Avon-booted Tyrell claimed the first of the three fifth places the tyre company would obtain. Even so, those who had the choice (such as Fittipaldi) went to Pirelli tyres in 1982, whilst those which didn't (such as March) carried on through 1982, waiting for another option. Michelin returned to competition at the start of 1983, having decided that F1 was too important on a marketing level for it to abandon. At that moment, the other teams flocked to its superior reputation, and Avon was no longer required - until Minardi decided it needed to do some winter testing in early 2003... Or so I surmise from the site; it only offers statistics, not the stories behind them, and all this ended three years before I was born. I knew I could depend on you, Alianora - thanks very much. And my memory is vindicated by the information you provided! Avon did indeed fill the gap left by Michelin's brief departure. I, for one, was sorry to see the British company abandoned once their usefulness had ended. It seemed to me that they deserved better than that. And they might have made tyres as good as anyone else's in time.